Jason's brother's fiancee was unfortunately not around during the Christmas in which I knit something for every member of the family, so I decided to knit her something for their honeymoon next month. 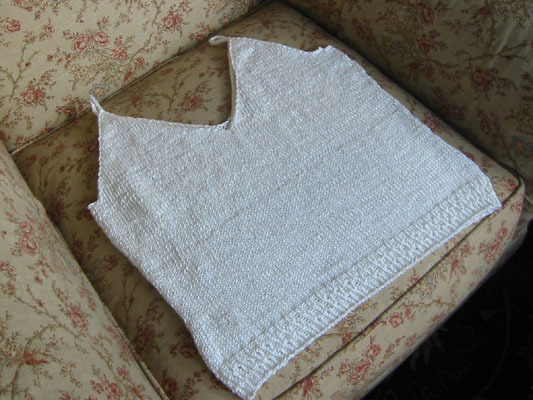 When the Spring issue of Knitty included a tank called the Honeymoon Cami I took it to be a sign... and away I went! Not so fast. First, gauge problems. So I re-wrote the pattern. Then, math problems. Followed by curly yarn problems, confusion on the pattern problems, sizing problems and an encore performance of gauge problems. I'm really not going to bore you with the details. It's in (or on the way to) the bride-to-be's hands as I write, and my fingers are crossed that it fits. If not, well, there's still 12 days before she goes to the chapel... I can try something else! Yeah! I wrote the pattern, so I'm always excited to see someone new finish it. Would you be willing to send me a modelled pic to add to my gallery? Despite guage/pattern/yarn issues, it looks great to me! Looks awesome! Hard to believe that's without blocking. Good job hanging in there and getting it right! Hope she loves it. Congrats on finishing the tank. Do let us know if it fits. It looks great and I'm sure she will love it and wear it on her honeymoon with lots of pleasure!